RANCHO SANTA FE — Helen Woodward Animal Center’s Pet Encounter Therapy program recently welcomed its newest animal to its therapy roster. Like every pet in the program, 3-year-old Dan Walker has intuitive therapy skills. Not only is he one of the few felines to make the program, but he’s a special needs animal who was born without his two back paws. Since the beginning of the center’s Pet Encounter Therapy in the 1980s, only six cats have been a part of the program. 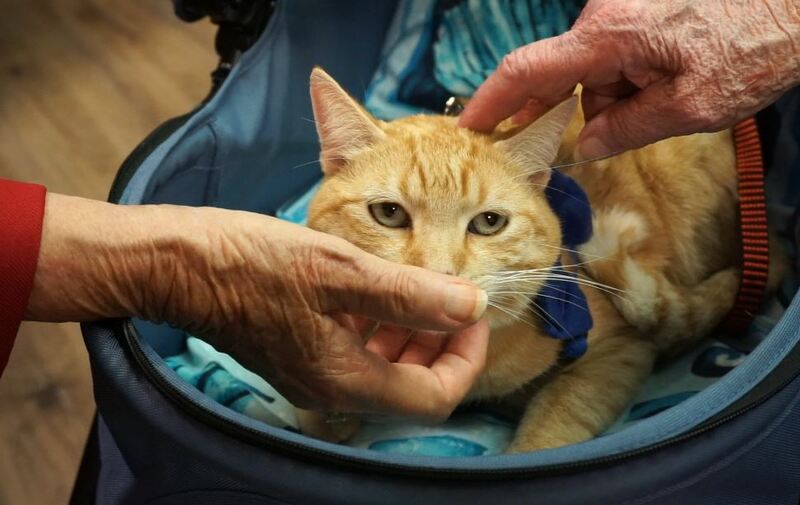 “Dan Walker is one of the best therapy cats we have ever had, and his special needs does not slow him down at all,” Public Relations Director Jessica Gercke said. According to Gercke, Dan Walker was found on the streets of Tijuana and needed medical help to treat his wounds. After he was all healed, his adoptive mom noticed how Dan Walker had a connection to humans and thought he’d make a great therapy cat. And it turns out that she was right and the cat also enjoys greeting people. Gercke said the most common therapy animals are dogs and finding a cat with these unique therapy skill sets is rare — not to mention how Dan Walker also enjoys car rides. His canine brother, Pilot, is also a therapy dog and they sometimes go on visits together. Dan Walker, along with the Pet Encounter Therapy gang, visits a variety of places such as skilled nursing facilities, schools, hospitals, shelters and more. Gercke went on to say that people relate to Dan Walker because he lives his life with such openness, love, and acceptance that it helps so many individuals experiencing their own challenges. “We’re really excited to have Dan Walker as part of our program because we have seen all the incredible love he gives and how he puts smiles on people’s faces,” she said. Over the years, the center’s Pet Encounter Therapy program has witnessed firsthand the numerous health benefits of human-animal interaction such as lowered blood pressure and positive energy. Pet therapy has also made a positive response impact on those who have been nonresponsive due to their health challenges. Various animals take part in the Pet Encounter Therapy program ranging from dogs and cats to rabbits and birds, and more. “These animals don’t judge us — all they want is to sit beside us and bring joy,” Gercke said. The Pet Encounter Therapy program currently has more than 65 volunteers and visits 50 or more facilities every single month.